Google I/O is Google's annual developer conference, where they share the latest products and technologies. Google I/O 2016 will be held in Mountain View on May 18-20. If you are not attending in person, you can get the I/O experience by watching I/O Live at the website or by attending Google I/O Extended events being organized by Google Developer Groups and other communities worldwide. GDG Philippines is organizing I/O Extended Manila Live-Viewing Party which will be held at Globe Corporate Showroom, Valero Telepark, No. 111 Valero Street, Makati City. (Map: http://bit.ly/Map-ValeroTelepark) on May 18-19 (08:00 PM of May 18 to 05:00 AM of May 19). 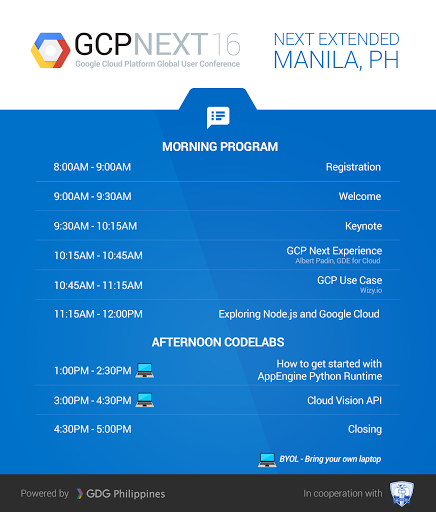 Add GDG Philippines in your Google+ circles for updates about this event and our other events. GCP NEXT is the largest gathering of the Google Cloud Platform community to explore the latest developments in cloud technology. GCP NEXT 2016 was held in San Francisco, California on March 23-24. 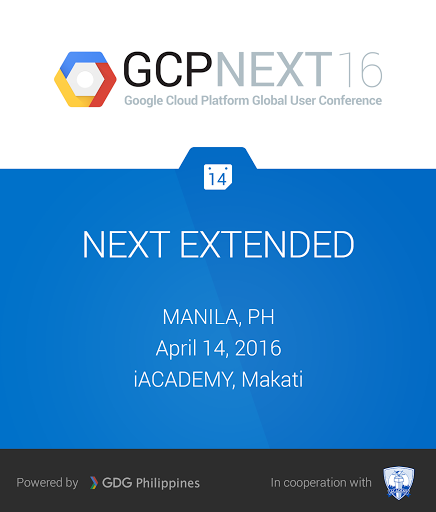 GDG Philippines is organizing a GCP NEXT Extended event this April 14. There will be the Keynote and talks in the morning. In the afternoon, there will be hands-on codelabs. Please bring your own machines for the hands-on. The venue for the event is at iACADEMY in Makati City.